Atrial fibrillation is the most common sustained cardiac arrhythmia. It is caused by disorganized electrical impulses generated in the atria overriding the regular electrical impulse being generated in the SA node. These disorganized impulses cause the atria (upper chambers of the heart) to quiver or twitch. This results in poor blood flow out of the atria into the ventricles and blood pooling in the atria instead of complete emptying into the ventricles. This blood pooling results in two problems: poor cardiac output and potential for blood clots to develop in the atria over time and potentially to be passed through the heart to the lungs and brain resulting in potential for PE and stroke. 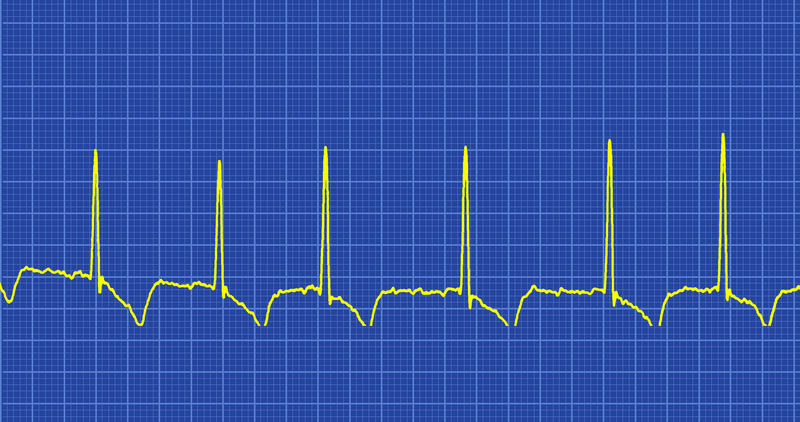 When atrial fibrillation occurs with a RVR, >100 beats per minute, it is considered a tachyarrhythmia. This may or may not produce serious symptoms. Patient may simply feel fatigued but be able to continue with his daily activities. On the other hand, if the rhythm persists over time the patient may begin to experience more serious symptoms such as dizziness, hypotension, and syncope; debilitating fatigue; palpitations, angina, or significant chest pain; SOB or respiratory distress; peripheral edema; jugular vein distension; and even pulmonary edema. For initial onset or an acute episode of atrial fibrillation, when the patient is stable, synchronized cardioversion may be considered to attempt to return the patient to a normal sinus rhythm. If the patient has been in the rhythm for more than 48 hours or the time of onset is unknown, anticoagulant therapy should be initiated before synchronized cardioversion is done. This will reduce the risk of emboli being expelled from the heart as a result of the cardioversion resulting in a MI or stroke. When atrial fibrillation is identified as a chronic condition, the patient’s physician may prescribe beta blockers and other medications such as digoxin to slow the rate. While this does not convert the rhythm to a normal sinus rhythm, the reduced rate increases the efficiency of the cardiac pumping action enough for the patient to have reduce symptoms and be able to resume normal activities of daily living. If it is determined that the atrial fibrillation is causing significant reduced cardiac output and the patient’s condition has become hemodynamically unstable or has other serious symptoms immediate cardioversion is recommended at 120-200 Joules biphasic or 200 Joules monophasic. Drugs are NOT used to treat unstable atrial fibrillation. Note paroxysmal Atrial Fibrillation of > 48 hours duration is unlikely to spontaneously revert to sinus rhythm and anticoagulation must be considered.